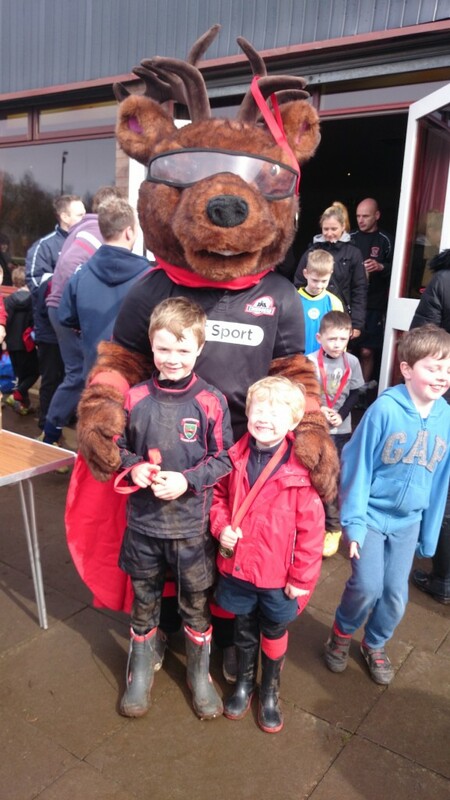 Micro rugby teams from Falkirk, Lasswade and Livingston visited Mains Park today for the 2nd annual Linlithgow Rugby Club micro rugby tournament. The tournament was a celebration of the skills, development and enjoyment of the game of our youngest players, with teams at P1, P2 and P3 testing their developing rugby skills against players from other clubs, many of them for the first time. Under variable spring skies, the 5-8 year olds gave us some hope that the future of Scottish rugby is in good hands as they showed off an attacking brand of touch rugby with many exciting runs, great passing and an abundance of tries. On a rare day out from Murrayfield, Edinburgh rugby mascot Flinty McStag made a special guest appearance to inspire the boys and girls. Flinty set off proceedings and was on hand to keep a special eye out for examples of team play and good sportsmanship, of which there were plenty.The kids were very excited to see him.